Suffolk Naturalist: Wow! What a dive! Hello dear reader, hope all is well in your little world and things are ticking along nicely for you. Been a bit busy of late with the run up to Xmas. However, I was awoken with a start on Thursday when the wifey on getting ready for exclaimed, "I think it snowed last night!" I jumped out of bed to see if what she was saying was true, however, it wasn't. It was instead a heavy frost that had not only covered the cars, but the road too and in the dim light of pre-dawn, did look like a dusting of snow had fallen. I was up now and the wife reminded me that I should take this golden opportunity to go our and get some nice crispy frost shots in the dawn light that was now emerging. So after a cup of coffee and a bowl of cornflakes, I was off in the cold frostiness of the morning, destination as usual was my local patch Purdis Heath. Once there I started to seek out some nice crispy views, however, the frost here wasn't so thick as back home and search as I did, I could not find anything to inspire me. I wandered around for about an hour before deciding to call it a morning. Then, as I walked back to the car I heard what at first I thought was a woodpecker. I stopped and waited for it again, but called out again and I thought it just didn't sound right for a woodpecker, then it called once more and I located the source. High above me in the blue sky a crow was cawing it as it mobbed a rather large bird of prey. I quickly whipped out my bins (binoculars) and just got focused on it to see it was a Peregrine Falcon (Falco peregrinus). Then it done something I never expected whilst I watched it intently through the bins. It suddenly folded its wings back, tilted forward and accelerated at such a speed I could hardly keep the bins on it. It disappeared behind some trees and as I lowered the bins I saw a sudden explosion of wood pigeons flying off in different directions from the golf course. The birds must have been feeding on the nice clear fairways and must've stuck out a mile to the peregrine overhead. So although I never got any nice photos, I got a sight I would've happily paid to see, a peregrine in a dive. The peregrine is the fastest animal on Earth with dives measured at over 200mph! The peregrine usually hits it prey at such a speed as to stun it, then turns to collect its stunned dinner. They have been noted to be nesting under the Orwell Bridge and last year on one of the quayside cranes at the Languard terminal on Felixstowe docks. The cocoon from the lagoon. Saturday found me with a little free time on my hands and with the weather looking sunny, yet chilly I decided to try somewhere new. Somewhere I have been meaning to check out for some time now, Suffolk Wildlife Trust's Levington Lagoon. As you can see from the link, the reserve was formed 60 years ago by the notorious great flood of 1953. Something we had a repetition of lately, but without the disastrous consequences. It's only a few minutes from where I live, just past the lovely little village of Nacton at the bottom of Strattonhall Drift. There's ample parking for about 6 cars if everyone parks considerately and although not well signposted, if you tap the postcode of IP10 0LH into your satnav/smartphone, this should take you pretty close to the car park. Ample parking at the car park. As I said, it was a chilly day with a cutting offshore wind. It wasn't long before I bumped into a birder who told me that he'd been watching a Grey Wagtail (Motacilla cinerea) down by the sluice. These are one of those birds that have a confusing name because the Grey Wagtail is actually yellow in colour. Compare that to the very common Pied Wagtail (M alba) which is seen walking around most car parks in the UK and is more grey than the Grey Wagtail. However, that said there is also the Yellow Wagtail (M flava) which is a kind of greeny yellow and definitely has less grey than the Grey and Pied Wagtail put together. Confusing I know, unless of course, unlike me, you're a birder. The birder also went on to tell me that he often sees a Kingfisher sitting above the sluice, but it wasn't about today unfortunately. On finding out I wasn't a birder he kindly told me where I could see Golden Plover's (Pluviarias apricaria) too. Unfortunately, not being the birder type, I really couldn't say for certain what a Golden Plover looks like, so I might have seen them and didn't know it when I decided to go off wandering. I must say, as lovely as I find the scenery of a coastal environment, I am more of a land lubber myself. I love being in the countryside in fields, heathland or woodland. 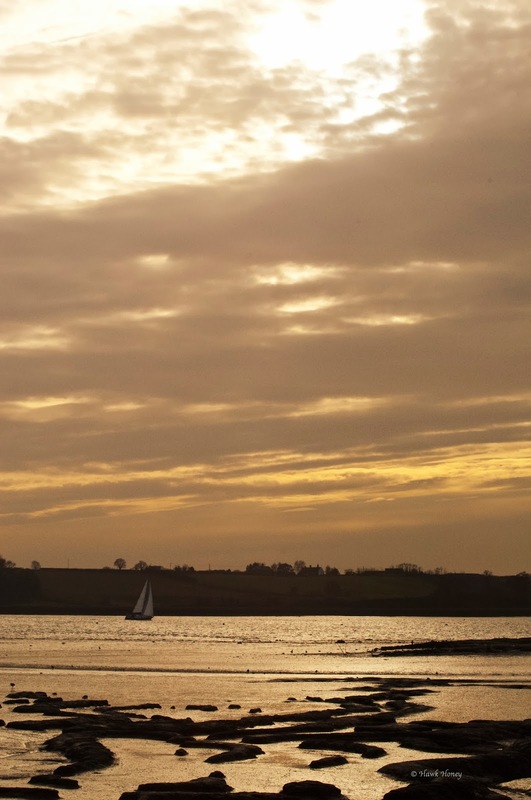 I struggle with estuaries, thick mud and being exposed to the wind which seems to blow incessantly. Yet, these sites are still important and I'm not suggesting they be ripped up or anything, I'm just saying it's not really my bag. However, I wasn't going to let my inner issues put me off and I continued with my walk into the cutting wind. 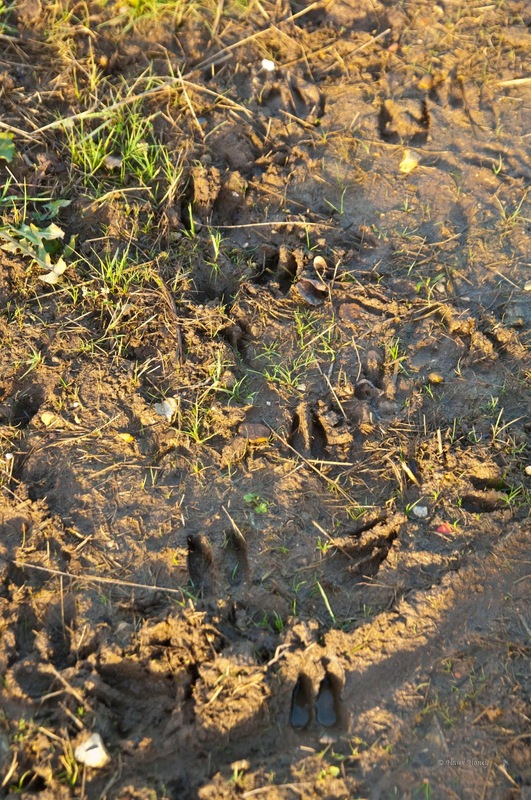 One of the first things I noticed in the mud just past the entrance gate were tracks, not dog tracks, but deer tracks. The small, paired indentations of the cloven hooves could quite clearly be seen and were most likely that of a Muntjac Deer (Muntiacus reevesi). A Chinese deer that was accidentally released into the UK countryside after captives at Woburn Park in Bedfordshire escaped. They are now widespread across the UK and cause untold damage to saplings by nibbling the protective bark from the trunks. They are also often seen dead on many a roadside through collisions with motor vehicles. As I walked along the path, it was quite clear this site is a wonderful place for birders as the air around me began to fill with strange and weird wonderful noises of bird calls. At one point I heard feint noises sounding like 'tseep, tseep' as a flock of about 20 Redwings (Turdis iliacus) flew over. I confirmed this later with the RSPB website which allows you to play recordings of bird calls. Trying to see the dark shapes amid the bushes was a pointless task but it did draw my attention to one tree in particular which was bare except for some weird attachments on some of the branches. Taking a closer look, I could see that they were indeed cocoons. However, cocoons of what I a m not sure. I noticed the tip of one branch with a cocoon on was broken slightly, so I removed it with my trusty knife taking care not to damage the cocoon. Another cocoon wrapped deep within the safety of thorns. Although I'm not sure whether these are lepidoptera or arachnid cocoons, Max Barclay of the Natural History Museum, through the medium of Twitter reckons they may be Lackey Moth (Malacosoma neustria) which feed on Hawthorn and Blackthorn and are resident in the southern half of Britain. Needless to say, the cocoon I removed is now sitting in my garden to overwinter till next year when I can see it emerge and can then confirm what it is. As I continued my walk along the lagoon, boats sailing back to their berths along the Orwell river made for some nice photo opportunities. I could see in the distance along the shoreline the various dippers, but they were too far away for me to get any photos. Then filling the sky ahead of me, was a flock of birds that I was later learn as a 'deceit' of Lapwings (Vanellus vanellus). Lapwings filled the sky, or were they being deceitful? Now, although I've said before that I'm not a birder, I always remember the first time I saw these birds, when as a young lad driving past a field in Romford, Essex. I suddenly noticed these strange unusual looking birds the like of which I had never seen before. No internet in those days, so I had to pop down the library to look at bird books to find out what they were. Interestingly, the main thing that has always stuck in my mind about these birds is that when they fly, they seem to have rather large disproportionate wings which seem to 'lap' the air in flight. 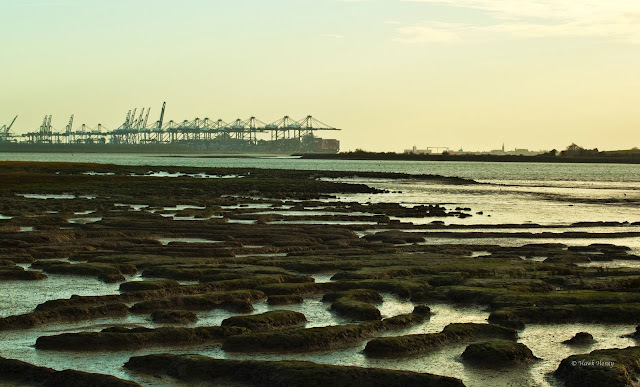 In the distance arose the un-natural scenery of Felixstowe Docks with the huge cranes unloading the huge ships full of the lifeblood of consumerism. Reaching the point looking out towards Felixstowe, I decided it was time for me to turn back and head home. 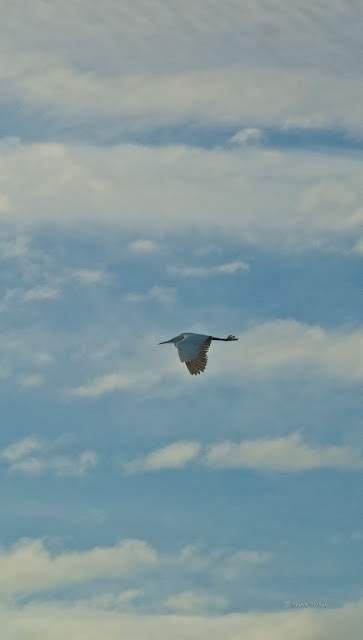 A couple of times I saw at distance, a Little Egret (Egretta garzetta) flying around. A recent visitor to our shores and some say this is due to global warming as the breeding range of this bird is spreading further north. They are very much like a small white heron (same family) and in my years as a truck driver I too have noticed their spread. As I walked back to the car, I noticed one feeding by the sluice, however, it was still too far away to get a good shot of it and I thought about sneaking up on it when I got back to the car. Yet, my plans were scuppered as suddenly I noticed a couple of dog walkers approaching the sluice along the path. Damn! I knew they were going to flush the bird as they approached so I prepared for the fleeing of the bird. The dog walkers approached and as predicted, the bird took off and flew in my direction into a head wind which held up its progress enough for me to get this shot. Needless to say, I was happy to get a photo of something I've seen about for years, but never been lucky enough to capture on my camera. Again, another nice end to the day. 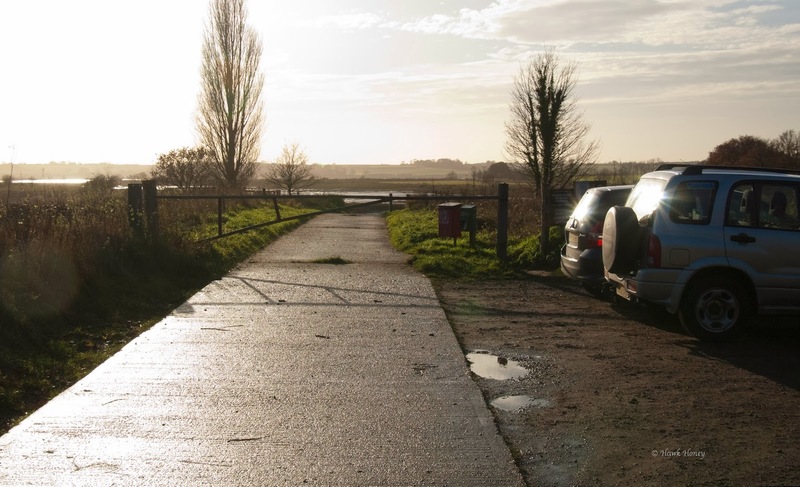 I look forward to returning next year when the weather warms up to see what Levington Lagoons has to offer then. No excuses, pick it up! I like dogs, lovely characterful animals that are always intrigued, pleased, displeased or scared to see you. However, some of their owners I like a lot less, especially when they don't pick up their dogs mess. This is a bit of an issue at Purdis Heath that is to be addressed in the near future it seems. However, one thing I saw at SWT's Levington Lagoon was this great idea of a poop bag dispenser. Brilliant! If these were placed everywhere inconsiderate dog walkers go, then they would have NO EXCUSE as to why they didn't pick up their dogs mess. 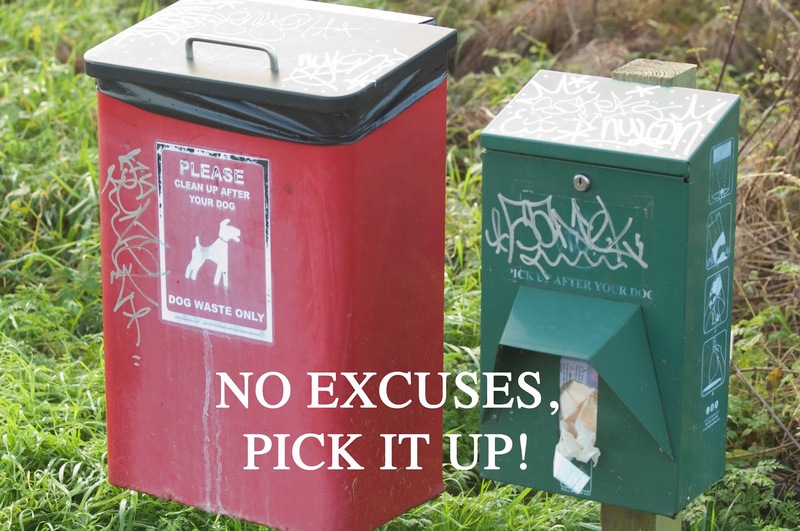 Come on you inconsiderate owners, step up to the plate and take responsibility for your dogs. After all, the dog didn't choose to be with you, you chose to have the dog. Bag dispenser, a great idea. That's it for now, keep safe and take care.